There are endless ways to spend your time in Albany and on the Amazing South Coast! Day One - Welcome to Albany! After breakfast (or before for the early birds) why not enjoy a beach side stroll along our wonderful walking and bike path - just 100m from the Beach House. The path offers magnificent views of King George Sound and the islands in the distance. Of course, you might prefer to wander along the beach itself and feel the sand between your toes, or borrow our bikes for a ride instead. Start your exploration further afield with a trip up to Mount Adelaide and Mount Clarence. Not only does Mount Clarence offer 360 degree view of the town ... taking in Middleton Beach, King George Sound and Princess Royal Harbour ... but it also your chance to connect with the ANZACs in Albany. As the departure point for 30,000 troops leaving for Gallipoli in 1914 and the place of Australia's first dawn service, Albany's maritime and military heritage will touch even the most hardened soul. Mount Adelaide is the site of Princess Royal Fortress ... built in the late 1800s to defend against invaders into Princess Royal Harbour ... the first port of call from Europe for most ships including precious mail. It is now also home to the absolutely spectacular National ANZAC Centre - an interpretive museum experience like no other. Historic, haunting, brilliant. While up on Mt Adelaide try Garrison Restaurant / Cafe lunch ... offering magnificent view of Princess Royal Harbour, slick service and local produce prepared with a sense of style. After lunch, head down the hill to clamber aboard the Brig Amity, a replica of the boat that brought Albany's first settlers from Sydney in 1826. Absorb some heritage - visit the Regency Museum ... a branch of Museum WA ... and the Old Gaol. Stroll central Albany from bottom to top making diversions for coffee, books, fashion, food and art. Tonight after a substantial lunch you may like to try a casual local Fish & Chips for dinner at Hooked! They're licensed so a glass or two of local wine with your King George Whiting or Snapper sounds just the ticket! Today is the day to travel beyond the harbour along a highlight packed tourist route taking in historic natural and made attractions. Then take the car and head through the city centre to Frenchman's Bay Road to explore the treasures beyond Princess Royal Harbour. Observe the elegance of the giant windmills at the Albany Wind Farm, and the miraculous 360-degree views afforded by the surrounding walk trails. Witness the power of the Southern Ocean at The Gap, Natural Bridge and Blow Holes. 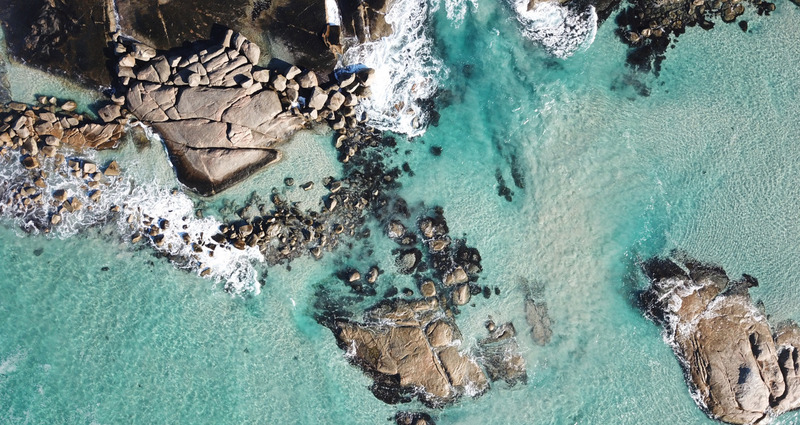 Find these iconic natural granite phenomena along some of Australia's most spectacular coastline in the Torndirrup National Park. Discover Albany's rich whaling history at the multi-layered Whale World museum as part of Discovery Bay Tourism Experience , where 3D movies and tours of an old whale chaser are part of the experience. Relax and enjoy a lunch of fresh local seafood and stunning views back to the town at Whale World's "Whaler's Galley" Cafe or wide your way back aliong Frenchman Bay Road and take a tipple at the Great Southern Distillery - winner of numeous international awards for its Albany distilled spirits. For the active among us ... dive the HMAS Perth, purpose-sunk in 2001 for the pleasure of marine enthusiasts or for a more leisurely afternoon perhaps enjoy a stroll along Goode Beach to Mistaken Island which is a great whale watching vantage point in season (June - October). Of if you are an active landlover the spectacular Bald Head Walk takes to the tip of the continent. Incredible! Why not try another Middleton beach Local tonight - Hybla offers great beach side location, casual atmosphere and beautiful fit out and conversion of the owners' family beach shack from years gone by! Great local lamb, beef and fish prepared with a casual flare... Hybla is located just two kilometres from the Beach House and offers gorgeous views over Middleton Beach. This restaurant fully licensed. The King and Kalgan Rivers are a short drive from Albany and are a playground for rowers, anglers, paddlers and skiers. Fancy some of the most gorgeous beaches in Western Australia all to yourself? Beyond the rivers, take Two Peoples Bay Road to Betty's Beach, Little Beach and Norman Beach - snorkelling in this area is spectacular and one of Albany's best kept secrets. Great walking trails and nature interpretive centre are also available in this area. Drop into Albany Old Marron Farm and enjoy a rustic lunch of fresh water seafood delicacies at Nippers Cafe. Try marron, yabbies, trout! Take the Chester Pass Road 40 kms to the ancient karri-topped Porongurup Range or further 20 minutes on to the Stirling Range. Porongurup Range - Easy walking tracks lead to great views from several peaks and flora and fauna are abundant. 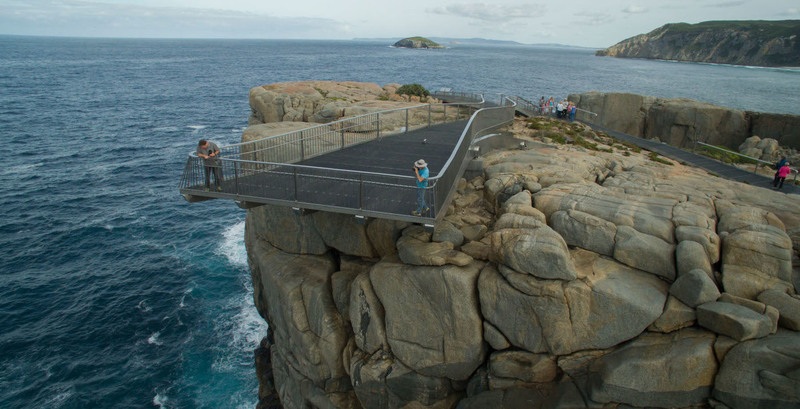 The Castle Rock Granite SkyWalk is a must do - don't foget your walking shoes, sunscreen and water - the views back across to Albany are magnificent. Visit the vineyards along the Porongurup Road and taste the effect of the unusual climatic conditions of the region's noted reisling and cabernet varieties. If you're in the area on Friday, Saturday or Sunday, don't go past Maleeya's Thai restaurant. Gourmet Traveller acclaimed authentic Thai cooking in the middle of the Porongurup Ranges or Ironwood Cellar and café are open from 11a.m. to 5p.m. Wednesday – Monday for wine tastings & sales, lunches, coffees/teas and cakes. When you hit Mt Barker take a right turn to explore historic Kendenup with incredible veiws of the Stirling Range and great wineries - try Arcadia and Gilberts. Its a further hour out to the Stirling Ranges - but if you prefer to hike to highest peak in WA it's certainly worth the trip! The unique climate of this area encourages more than 1500 species of flowering plants, Information shelters in the park provide facts about the plant an animal life of the area. More strenuous walking is also on offer in the Stirlings ...climb Bluff Knoll...1096 metres ... or simply take in the great view from the car park. After a huge day of exploring you may like a quiet night tonight. Why not select a DVD from the lounge, arrange a light dinner from our In Room Dining menu and have a relaxing night in? Head along the Lower Denmark Road and visit Cosy Corner ... sheltered and beautiful beach for picnicking or walking. Watch hang gliders at Shelley Beach in the West Cape Howe National Park. Take in the highlights of William Bay National Park, starting with the delightfully clear and pretty Greens Pool, a safe swimming and snorkelling spot. Madfish Bay and the impressive granite boulders at Elephant Rocks area a short walk away. If just going as far as Denmark, enjoy lunch at one of Denmark's beautiful winery locations. Try a magnificent platter lunch at The Lake House - one of the prettiest cellar doors you will see. If you wish to travel a little further afield continue along South West Highway towards Walpole and take in the region's famous TreeTop Walk. This is a wonderful showcase of the unique tall timber country in the region. The boardwalk is an easy walk for all, and gives a perspective of flora and fauna from the height of the tall tree tops. Wonderful! Back in Albany why not try "The Venice" our local "Italian" - an absolute favourite with all from Albany - The Venice is located in the centre of York Street and is BYO.